My mechanic is awesome. Five years ago when my car failed inspection and I needed to get it fixed, I had no idea where to take it. After one not so pleasant experience at one place, I hit the internet to find a suitable shop. What sold me was his site. It wasn’t anything fancy, but the fact that he had one was miles above everyone else. Feeling confident, I made an appointment and the rest was history. While his site may have been what brought me to his shop in the first place, his customer service is what keeps me going back. Now you might be wondering what my mechanic has to do with how to treat clients. The answer is in the details. While my mechanic is probably just as good as any other mechanic, his shop goes above and beyond. Because of this, I happily pay a premium to get the service I’ve come to know and love. Regardless of what industry you’re in, you can use the same methods to wow your customers and keep them coming back. Never underestimate the power of a thank you. Without fail a week after my car is in the shop, I receive a thank you card in the mail. 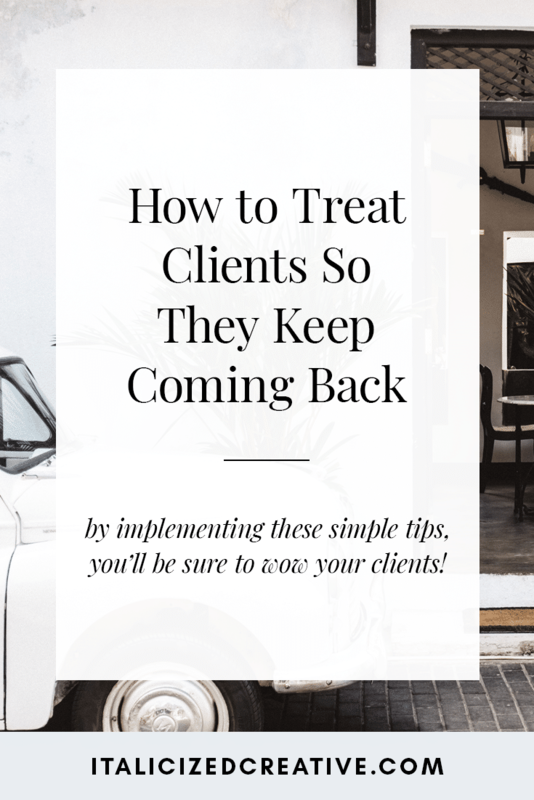 While the client is usually the one doing the thanking, it’s incredibly important as a business owner to thank your clients for their business. Everyone likes to feel appreciated. And if you go the snail mail route, a thank you note will be a welcome surprise among a mailbox full of bills. When I take my car into the shop, I expect it to get fixed. End of story. So when I pick up my car and it’s freshly washed and detailed, I’m a happy camper. No where does my mechanic say that he’s going to clean my car, it’s an added bonus. You can do the same for your clients. Deliver on what you’ve promised, but then throw in an extra or two. Throw in Facebook and Twitter headers if they’re not included as a part of your design package. Include an extra feature that’ll wow them. The sky is the limit! It doesn’t have to be anything extravagant, just a little bonus that will make your clients smile at how generous you are. Who doesn’t like getting gifts? While over delivering is a gift in and of itself, an actual little gift is a nice gesture. My mechanic is known for leaving scratch offs in cars, which is far from expensive, but imagine if a customer won big? No matter the size of your budget, you can incorporate gifts into your business. Whether it’s a Hershey bar with a custom wrapper, a notepad, or even a helpful book, it’s the thought that counts. You’re already thanking your clients, spoiling them with gifts, and over delivering, how else can you reward them? With discounts, of course! My mechanic has a rewards program setup where you earn points for dollars spent. Earn a certain amount of points and you get a coupon for a discount off your next service. While discounts can be a tricky thing, if you’re going to do any sort of discount, giving them to loyal customers is the way to go. They’ve proved that they’re willing to pay your prices so you know they’re not just in it to save money. Most weeks I receive some form of mail from my mechanic. Sometimes it’s a reminder about how I need my oil changed, sometimes its a newsletter, and sometimes it’s something completely different. The fact is, they keep appearing in my mailbox, so I never forget them. And while they’re going old school and sending out actual mail, this is what email newsletters are great for. Keep your past and potential clients in the loop so when they need your services, you’re the first person they think of. How can you apply these tips in your design business?